SOBA provides online undergraduate-level training in programs that blend Biblical Education and Apologetics: a 2-year Associate of Christian Education (A.C.Ed. ), a 4-year Bachelor of Christian Education (B.C.Ed. ), as well as a flexible degree completion Bachelor of Christian Education (B.C.Ed.) program which may be completed in 1 or 2 years, depending on transfer credits. Our B.C.Ed. degree currently provides a choice of several academic minors to allow concentrated study of different areas of Biblical Education and Apologetics. Completion of both the A.C.Ed. and the B.C.Ed. programs is possible in less than 48 months. Transfer credits from other schools may reduce the program timeframe. For a complete description of minors, courses, and credit transfer policies, see our catalog. Creation Apologetics: Creation apologetics requires both proactive and reactive presentations of truth, about God’s Word and about God’s world. Creation apologetics, in many contexts, is a specialized form of biblical education. Biblical education—the heart of the Great Commission—requires five important teaching elements, as described in Ezra 7:10, which are the preparation of the heart, seeking the Law of the Lord, doing the Law of the Lord, teaching God’s statutes and ordinances, and God revealing his Law to us. This educational emphasis is blended with biblically sound creation apologetics, detailed primarily in Genesis 1-11, ultimately providing accurate and analytical answers to honest questions along with logical refutations of science "falsely so called" (1 Timothy 6:20). In addition to the above requirements SOBA reviews prior academic performance as a probable indicator of prospective academic success. 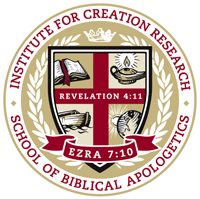 ICR’s School of Biblical Apologetics, as a matter of institutional academic viewpoint, endorses the official creationist tenets of the Institute for Creation Research, which are described at the end of the catalog under the heading “Foundational Principles.” Each applicant acknowledges that he/she has carefully read all of ICR’s creationist tenets (www.icr.org/tenets), and that he/she understands that all SOBA courses will be taught from the viewpoint of these tenets. Students who provide less-than-truthful statements during the application/registration process will be subject to removal from the program.